A population-based register covering births to mothers resident in the counties of Cork and Kerry in southern Ireland. The Register follows the protocol of the EUROCAT network of registries. Newsletters available at LENUS (www.lenus.ie/hse). 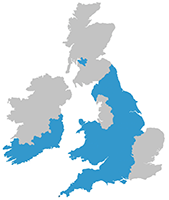 Cork & Kerry is a Full Member of EUROCAT and is referred to as Cork & Kerry (Ireland) in the EUROCAT data. For more information about Cork & Kerry, click here.